Much of the food waste in Massachusetts is still not being recycled as outlined in the Commonwealth’s organic waste ban. There are a number of success stories such as Whole Foods, which recycles the organic waste from 17 of the company’s 32 Massachusetts stores. Nearly 70% of respondents say that a strong sustainability plan would affect their decision to stay with a company long term. In fact, about 30% have left a company due to its lack of a corporate sustainability agenda and over 11% have done so more than once. The City of New York Department of Sanitation (DSNY) announced that on February 15 it will begin enforcement of a city law requiring some larger restaurants, chain restaurants and grocery stores to separate their food waste from their trash, and ensure it is beneficially reused, not sent to a landfill. Vanguard Renewables is featured in a January 31, Waste Dive article by Cole Rosengren. The company recently opened its latest farm-based anaerobic digester, with more on the way. CEO John Hanselman explains why his business works where others have failed. Vanguard is the largest recycler of food waste in the Northeast. 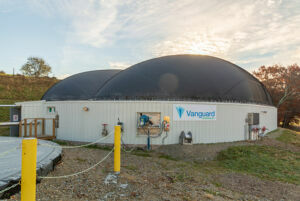 Vanguard Renewables uses an “everybody wins” approach as it builds, owns and operates anaerobic digesters on dairy farms to process food waste and manure according to a recent article by Nora Goldstein in BioCycle Magazine. 74 percent of Americans would rather shop and spend money at a business that recycles and reuses materials according to a new study by The Recycling Partnership. Food to Fuel—It is Not as Easy as it Seems! Food to Fuel article in December Waste Advantage Magazine by Vanguard CEO John Hanselman touches on the challenges and the benefits of organics recycling to renewable energy. There have been significant recent changes in the recycling landscape for municipalities since the exit of China and these are affecting municipalities and haulers in Massachusetts and around the country. Bar-Way Farm Inc. Deerfield, Mass.